​USERRA provides employment protections for members of the uniformed services of the United States in their civilian careers. Uniformed services include current, former, and prospective members of: active duty U.S. military, National Guard or Reserves, and certain other services like the Commissioned Corps of the Public Health Service. 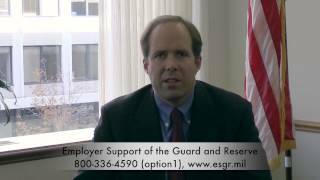 Q:I am a veteran or disabled veteran, does USERRA cover me? Q:How long does a USERRA claim take? Q:I’m going away on military duty, do I need to give copies of my orders to my boss? Q:When I return from military duty, do I have to report to work right away? ​In order to obtain reemployment protections under USERRA when you return from military duty, you must report for work within a specific time period. The length of this time period is determined based on the length of your military duty. If you were on military duty for less than 30 days, you must report to work on the next regularly scheduled business day or shift that you normally work. ​​​USERRA also provides that the service member is entitled to travel time from their place of military duty to their residence, plus 8 hours rest; for example, if an individual works a night shift and their military duty ends at 5:00pm on Monday January 1st, and their next regularly scheduled shift is a night shift at 8:00pm Monday January 1st, that individual would not have to report for that shift, but the next one (8:00pm on Tuesday, January 2nd). ​If you were on military duty from 31 to 180 days, you have to report to work within 14 days of the end of your military duty. If you were on military duty for more than 180 days, you may report to work within 90 days of the end of your military duty. Q:How should my employer have me listed in their payroll system while I am on military duty? Q:I have more questions about USERRA, are there other resources available to me? ​Please see our USERRA information page for more detailed information and links to other resources. If you have a question that is not covered on our website, please call OSC’s USERRA hotline at (202) 804-7003.